Psy Agency is the Psychedelic Trance project of Ingmar Trenkelbach (Jean Luc) and Sebastian Werner (Buster) which is based in North Germany. The two dudes crashed together in 2001 and they started organizing Psy-Trance parties actively for 7 years and began DJing FullOn style. It was the next logical and intended step starting to produce their own music. At childhood Jean Luc enjoyed a musical education playing violin. In adolescence he was a drummer in a punk band. He also played piano and guitar for him self. 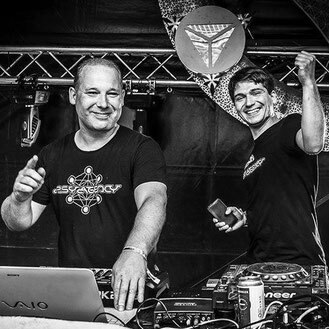 When Buster was infected with making music both founded their Psytrance project. Their music is influenced by Rock, Breakbeat, classic music and 80's, paired with the openness to Progressive Trance and other electronic styles. FullOn with wide and playful melodies stamp their musical style, which can take very different directions. It’s a radical approach, audacious even. This is probably the very reason why it is a winning approach, as the duo keeps proving ever since they released their debut album on Geomagnetic in 2014. Since that time they played a lot of gigs in Germany and other European countries. Psy Agency - your specialist for ecstatic euphoria!